Pyramid Lake is a reservoir formed by Pyramid Dam on Piru Creek in the eastern San Emigdio Mountains, near Castaic, Southern California. It is a part of the West Branch California Aqueduct, which is a part of the California State Water Project. Its water is fed by the system after being pumped up from the San Joaquin Valley and through the Tehachapi Mountains. Pyramid Lake and San Emigdio Mountains. In 1843, gold was discovered near what is now Pyramid Lake, in the Santa Feliciana Canyon, just south of what is now Pyramid Dam. The small find failed to trigger a rush to the mountainous countryside. Only Francisco Lopes, owner of Rancho Temescal, a Mexican land grant, and a handful of ranchers attempted to settle the region. This lake was created in 1972, and completed in 1973, as a holding reservoir for the California State Water Project. The lake was named after a pyramid-shaped rock carved out by engineers building U.S. Route 99. Travelers between Los Angeles and Bakersfield christened the landmark “Pyramid Rock,” which still stands just adjacent to the dam. Pyramid Lake is the deepest lake in the California Water Project system, built up along the steep canyon walls surrounding Piru Creek. The 180,000 acre⋅ft (220,000,000 m3) reservoir lies on the border between the Angeles National Forest and the Los Padres National Forest, in the northwestern portion of Los Angeles County. It is to the west of Interstate 5 (I-5) south of Tejon Pass. The former alignment of US 99 is below the waters here, replaced by I-5. Pyramid Lake seen from the air with the Pacific Ocean in the distance. Just below the dam, Piru Creek returns to its natural state as it winds down through the Topatopa Mountains to feed into the Lake Piru reservoir and later the Santa Clara River. Pumps carry water from Pyramid Lake to Castaic Lake, which is the terminus of the west branch of the aqueduct. Pyramid and Castaic act as the upper and lower reservoirs for a 1,495-megawatt pumped storage hydroelectric plant. The 118 m (387 ft) earth and rock dam was built by the California Department of Water Resources and was completed in 1973. Pyramid Lake is part of the California Aqueduct, which is part of the California State Water Project. Outflow goes downstream to Castaic Lake, which is the terminus of this West Branch aqueduct line. Pyramid and Castaic act as the upper and lower reservoirs for the Castaic Power Plant; a 1,495 megawatt pumped storage hydroelectric plant. It is the deepest lake in the California Water Project system. Its name comes from the Pyramid Rock, created when a ridge was cut through in 1932 by the Ridge Route Alternate (US 99). Pyramid Rock still exists directly in front of the dam. View south towards Pyramid Dam from boat. Pyramid Lake offers boating, fishing, jet skiing, and picnic areas (including 5 unique sites that are accessible only by boat), and courtesy docks. Vista del Lago Visitors Center overlooks the lake. Access is from Interstate 5 exit on Vista Del Lago. Fishing is allowed from every location at Pyramid Lake. You can catch fish such as large mouth bass, small mouth bass, striped bass, blue gill, crappie, and some trout. The California Office of Environmental Health Hazard Assessment (OEHHA) has developed a safe eating advisory for fish caught in Putah Creek based on levels of mercury or PCBs found in local species. ^ a b c Pyramid Lake (Brochure). Dept of Water Resources, State of California. p. 2. Retrieved 27 May 2014. ^ "US 99 – Piru Gorge, Beneath Pyramid Lake". p. 6. Retrieved 27 May 2014. ^ Admin, OEHHA (2014-12-30). "Pyramid Lake". OEHHA. Retrieved 2018-06-13. 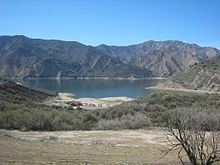 Wikimedia Commons has media related to Pyramid Lake (Los Angeles County, California).